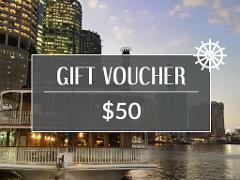 Cruise the Brisbane River day or night with this $50 Cruise Gift Voucher. Select a City Lights Dinner Cruise, enjoy a lunch cruise with live entertainment or indulge in High Tea on the water. The choice is yours. 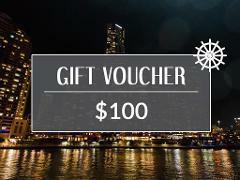 Cruise the Brisbane River day or night with this $100 Cruise Gift Voucher. Select a City Lights Dinner Cruise, enjoy a lunch cruise with live entertainment or indulge in High Tea on the water. The choice is yours! 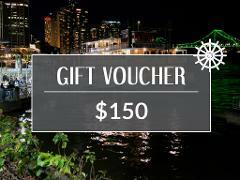 Cruise the Brisbane River day or night with this $150 Cruise Gift Voucher. Select a City Lights Dinner Cruise, enjoy a lunch cruise with live entertainment or indulge in High Tea on the water. The choice is yours! 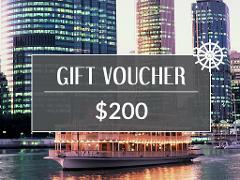 Cruise the Brisbane River day or night with this $200 Cruise Gift Voucher. Select a City Lights Dinner Cruise, enjoy a lunch cruise with live entertainment or indulge in High Tea on the water. The choice is yours! Give the gift of High Tea. Indulge in High Tea, bottomless bubbles & selected beer, blooming tea as we cruise the Brisbane River aboard Kookaburra Queens or grand Voyager. 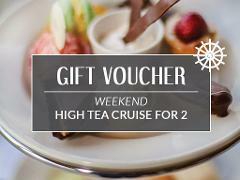 Valid for two on any High Tea. Valid for two adults on a Weekday Lunch Cruise. Take in the views of Brisbane's stunning riverscape as we cruise past some of the city's iconic sites. Valid for two adults on a Saturday Lunch Cruise. Take in the views of Brisbane's stunning riverscape as we cruise past some of the city's iconic sites. Indulge in contemporary buffet with seafood, free soft drink, beer and bubbles. Valid for two adults on a Sunday Lunch Cruise. Take in the views of Brisbane's stunning riverscape as we cruise past some of the city's iconic sites. Indulge in contemporary buffet with seafood, free soft drink, beer and bubbles. Give the gift of cruising with a weekday sightseeing cruise for 2. See the best of the Brisbane River aboard Kookaburra Queens or grand Voyager. 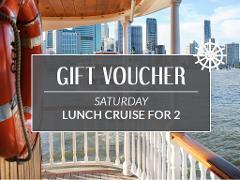 Valid for two guests on board weekday sightseeing cruise. 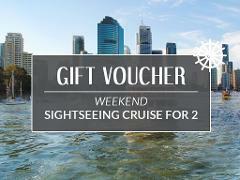 Give the gift of cruising with a weekend sightseeing cruise for 2. See the best of the Brisbane River aboard Kookaburra Queens or grand Voyager. 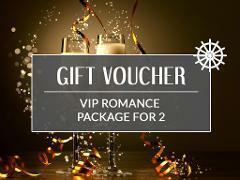 Valid for two guests on board weekend sightseeing cruise. 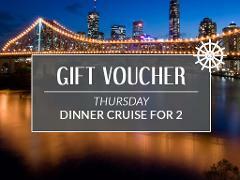 Experience the city lights of Brisbane from the river, spectacular cuisine and great entertainment. Thursday Dinner Cruises offer a sensational contemporary buffet, live entertainment and million dollar views. Experience the city lights of Brisbane from the river, spectacular cuisine and great entertainment. Friday Dinner Cruises offers a sensational contemporary buffet, live entertainment and million dollar views. Experience the city lights of Brisbane from the river, spectacular cuisine and great entertainment. Saturday Dinner Cruises offers a sensational contemporary buffet, live entertainment and million dollar views.